Some art has a spiritual interpretation. It may not be the intention of the artist, nor be the only possible interpretation. But here goes. This image is on every place-mat in the land, you might say it is the cliché of English clichés. What is shown — besides the effortlessly natural & lovely Suffolk countryside — is the staunching of the hay wain’s wooden wheels in a millpond: the wood swells against the iron rims and makes the wheels stronger. All the humans are going about their everyday purpose without pause or variation. But the small dog — whose senses are beyond ours — is waiting for something new. This is a picture of the interior path to a place beyond the normal. They are immersed in water — a symbol of truthfulness since it always finds its own level. They are headed, in stillness but with the front wheels turned, towards a field of gold — a symbol of heaven on earth. They couldn’t move there by human willpower — various physical obstacles prevent that. They’re leaving normal sustenance to each side — drawing drinking water on the left and fishing for food on the right. And there’s no hay in the hay wain — the interior journey needs worldly emptiness. 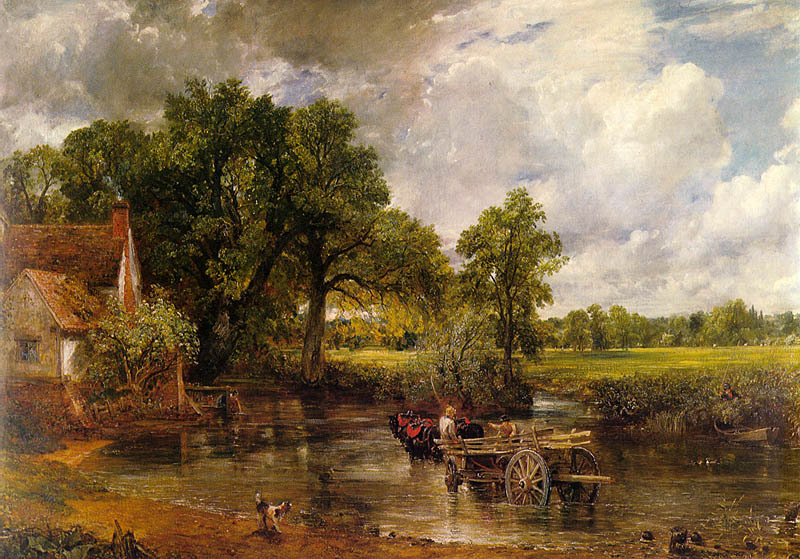 John Constable was contemporary with William Blake, near enough. They are considered contraries, though both Romantics, but Blake’s luminous metaphysics was never so immediate and natural as this. The original is in the National Gallery, London, of course.